BAGHDAD — More than two dozen people were killed when Shiite militants ambushed a U.S. patrol in Baghdad’s embattled Sadr City district, bringing the death toll in the area on Tuesday to more than 30, a U.S. military spokesman and Iraqi officials said. The clashes broke out at 9:30 a.m. after U.S. troops were attacked with rocket-propelled grenades and machine guns, spokesman Lt. Col. Steve Stover said. BAGHDAD (AP)—Shiite militants ambushed a U.S. patrol in Baghdad’s embattled Sadr City district on Tuesday and more than two dozen people were killed in the fighting, a U.S. military spokesman and Iraqi officials said. Six American soldiers were wounded. BAGHDAD — Mortar barrages and gunbattles in Sadr City forced the U.S. military yesterday to delay one of its most ambitious “hearts and minds” campaigns in the vast Shi’ite slum northeast of central Baghdad. U.S. forces battled to push Shi’ite fighters farther from the Green Zone in central Baghdad, a day after at fierce gunbattles left at least 38 militants dead. Four U.S. soldiers were killed in fighting yesterday. U.S. officials were encouraged by a decrease in rocket fire compared with Sunday, when a sandstorm provided cover for Shi’ite fighters to send volleys of rockets at U.S. and Iraqi targets. No “ambush”, no misleading headline implying 30+ American dead. No, this version focuses on the wall; it’s a “hearts and minds” project designed to keep the residents of Baghdad safer. al-Sadr, & Mahdi Army: bad guys, now referred to as “criminals” since they are defying the Iraqi government. Also, new Bush doctrine says don’t call them jihadis anymore. Duh. AQI: Al-Qaeda in Iraq: bad guys. SOI: Sons of Iraq: good guys. Local village and tribal militiamen. MNF: Multi-National Forces: good guys. Our troops, British troops, etc., working together with Iraqi Army troops. MND: Multi-National Division: good guys. See MNF. IA: Iraqi Army: good guys. Iraqi troops trained well enough to fight on their own. Iraqi Police: maybe good, maybe bad. There have been problems. BAGHDAD – Multi-National Division – Baghdad Soldiers killed 28 criminals in an extended small-arms fire engagement against Special Groups criminals in eastern Baghdad April 29. At approximately 9:30 a.m., a U.S. patrol received small-arms fire, wounding an MND-B Soldier. As the Soldier was being evacuated, a U.S. vehicle was struck by two improvised explosive devices, and received small-arms fire and rocket-propelled grenades. One vehicle was damaged in the attack and two other Soldiers were injured. The three Soldiers and a fourth also injured in the heavy SAF and RPG attacks that followed were evacuated to a nearby combat outpost. Another U.S. vehicle was damaged by a third IED in the attack, and two Soldiers suffered minor injuries in the fighting that followed. None of the U.S. injuries are life threatening. Using a combination of weapon systems available, including a Guided Multiple Launch Rocket System, MND-B Soldiers from 3rd Brigade Combat Team, 4th Infantry Division, defended themselves and as the fighting ebbed, at least 28 militants were killed in the four-hour engagement. “We will defend ourselves and the law-abiding Iraqi citizens,” said Col. Allen Batschelet, chief of staff, MND-B and 4th Inf. Div. “We continually show great restraint and professionalism when attacked, and clearly identify the enemy before engaging their positions. The enemy continues to show little regard for innocent civilians, as they fire their weapons from within houses, alleyways, and rooftops upon our Soldiers. So what may have started out as as some “militant” “criminals” taking a potshot at some soldiers turned into a half day long fight. Was this a bigger action than CentCom is reporting, or was it just a patrol that got pinned down for a long time? It’s so hard to tell. 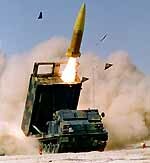 Oh, and if you don’t know what a Multiple Launch Rocket System, usually acronymed as an MLRS, it’s a tank-like vehicle that has a rack of small missiles on the top. Call it the modern US version of the old Soviet Katusha launchers. The news articles refer to “warheads weighing 200 pounds”, which means the Army’s M39 missile, shown in the picture. Think of it as a medium range rocket propelled guided cluster bomb. More than enough to take out a whole “gang” of “criminals” and the house they’re hiding in. I have no idea why on earth our guys would use a missile that has a range of over 100km in a neighborhood firefight, but when you need it you call down whatever thunder you can find. And it worked just fine, obviously.